This review should be read in conjunction with Mark Wheeler's review of the JMR Arpeggione loudspeakers, which contains much related information, though each review was conducted independently. 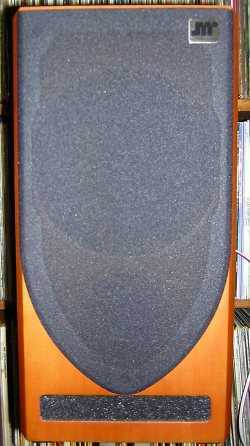 I did not know of the JMR range of loudspeakers before agreeing to review these standmounters. However, I looked forward to hearing them, because of their warm recommendation by the UK distributor, Paul Letteri, and because they fall into the price category of being “theoretically affordable to the ordinary working person". I know this is an absurdly subjective category, but I find it hard to get excited about audio products with astronomical price tags. Woofer: Diameter 6.7", double magnet system, double moving coil flat ventilated spider. 1.1" moving coil on a high temperature support, positive half-roll peripheral surround in natural rubber short fibres paper cone. Soft, decompressed central dust cap. Tweeter: 1.2" impregnated fabric dome. Central neodymium magnet. Horn front frame and wave-guide for minimum lateral directivity and perfect conservation of energy at a distance of several metres. Crossover: 3-way electric. Slopes 6 and 12 dB/octave, serial configuration for midrange/treble. Crossover frequencies at 1400, 4500 Hz. Loudspeaker system: Tuned triangular transmission line with slim, anti-noise event port. Machining in 0.75" MEDITE double face aniegre veneer. Bevel edges to eliminate edge effects. On unpacking them I was not disappointed. Viewed from the front, their aesthetic appearance is very pleasing. The Medite cabinets are veneered with cherry stained Aniegre, with bevelled edges on the left and right sides. The shield-shaped grilles, fixed at three points, add a further touch of distinctive style. These are easily removed and stowed on top of the speakers for listening sessions. As can be seen from the picture, the front is also fully veneered, maintaining the overall impression of quality. In houses with no danger to drivers from children or pets, the best thing would be to leave them off. To the rear there is provision for bi-wiring. I did not use this facility, but bridged the gold plated inputs with good quality jumper cables supplied by Paul Letteri. 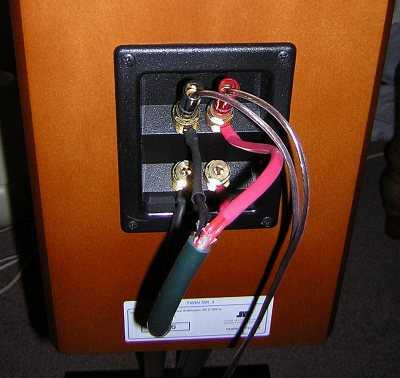 The picture of the inputs was taken before I switched to the Microphonic Original speaker cable. What of the sound? The speakers were new when supplied and, noting that both the supplier and manufacturer recommended at least 50 hours of break-in time (with optimal performance after 200-500 hours), I placed them on the stands normally occupied by my KEF 104s and prepared to wait a long while before I could make a fair assessment of them. However, even at first listening, my impression was, “Hmm, nice, I could live with these." From the start, I enjoyed the smooth, nimble yet full sound coming from these small speakers. My listening room is less than ideal being smallish (dimensions 4.6 x 3.3 m or 15' x 11'), with a large assortment of audio equipment and walls of vinyl having to share the space with family dining requirements. Small speakers have obvious advantages for a room of this size, but my experience has been that this is usually at the cost of losing the full, assured sound which is part of the point of high quality audio. However, these speakers seemed to be able to go down improbably low for their size. Paul had said that I might find them a bit light in the bass, and had thoughtfully supplied a subwoofer for me to try with them. However, during my time with the Twins, I found that I preferred listening to them with the subwoofer switched off, or set at a frequency of about 40Hz. For about three weeks, I paid no special attention to the speakers, just using them for everyday listening for an hour or two at a time. Over this time I noticed that bass got fuller, but not at the expense of the overall balance of the sound. I experimented with the two different sets of stands I use (neither being the original KEF Daleks!). Neither is anything special and, at 40cm each, neither was quite at optimal height, given the presence of a table in the room. The spiked pair offered a little sharper presentation, but on the whole I preferred and used my usual Z-shaped Reference ones. As Mark Wheeler found with the Arpeggiones, I found that it was possible to place them as widely apart as possible and still enjoy a coherent soundstage. All too soon Paul returned from his visit to the States and it was time to arrange for their return. I had got so comfortable with the Twins that it was hard to be objective about them. I switched back to my KEFs for a couple of days, and enjoyed their assured neutrality. But, was there also a touch of harshness in the T27s that I had not noticed before, and the famous the Bexdrene midrange driver seemed to honk a little more than I remembered. Returning to the Twins, I was able to see what I appreciated most about them: their overall balance. No particular aspect of their sound draws attention to itself. While listening to them there is the sense of everything sounding just the way you expect that it should. Everything? Well, almost everything. Even with the grilles off, I found that the fabric dome tweeter seemed a little soft. But that is my only complaint. And, please bear in mind that I did most of my listening tests with vinyl: with CDs this touch of HF softness is most welcome, at least to me. Given this experience, there seems no point in running through a list of my experiences with different kinds of music. Anyway, one gets through a lot of different music in a month. Suffice to say that the Twins always seemed to make the music sound right. That doesn't necessarily mean objectively accurate—the bass drivers naturally have limitations, but these speakers get the scale and the proportions right, and therefore give the listener the reassurance to ignore what is missing and pay full attention to the music. As the old saying goes, less hifi and more music. Though curious about their triangular transmission line construction, I did not venture to inspect the speakers internally. The design works well, delivering smooth bass through the foam filled slot at the base of the baffle. When a device works to or above my expectations, I find that I find that I feel less of an inclination to meddle with it! A review by Bruce Kennet (Listener, Sept/Oct 2000) explains how the two drivers work three ways: “this is a two-way system mechanically, but three way electrically—the mid/bass driver has a dual voice coil and is fed from two separate crossover sections." It will be clear that my overall assessment of these speakers is hugely positive. Glancing now at the findings of other reviewers, I agree with the general view that they excel in their ability to present music in a balanced and natural way. It is a pleasure to discover speakers that look and sound so unobtrusively beguiling. As I prepare to pack them up and return them to the distributor, I suspect that I shall give them a high score on Geoff Husband's “miss you factor" scale too! Finally, thanks to Paul Letteri of HiFidelityAudio for inviting me to review the JMR Twins Mk III. He can be contacted by email through the company website, or by phone at 0044-1480-216039. The manufacturer's website gives details of distributors worldwide. 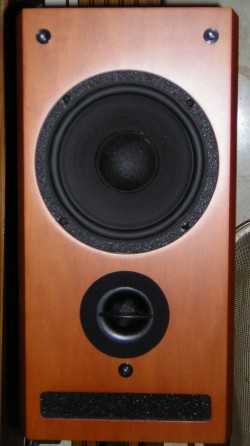 As mentioned above, Paul Letteri, supplied a subwoofer for use with the Twins. He selected the Reference 100 as the one representing the best value for money (RRP £350) at a price point that made it likely to be paired with the Twins. This was my first encounter with a subwoofer, and I enjoyed learning to tune it to work unobtrusively with both the Twins and my KEF 104s. In my room, I did not find that the subwoofer was needed, and when I did use it I seldom ran it above 42Hz. This serves to underline for me the balanced tunefulness of the Twins. With my KEFs, I did find some use for the subwoofer, though again not above 40Hz. I suspect that it was not really suited for use in a room of my size.